Hey everyone! I’m John from The Laziest Vegans In The World and this is my first VeganMoFo blog post so of course it would be a pre-packaged giveaway. 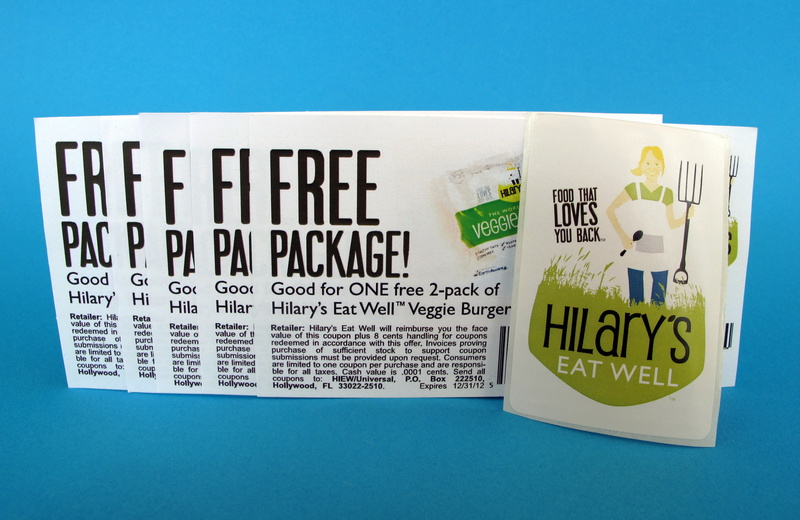 Today’s giveaway is for five free Hilary’s Eat Well Veggie Burger coupons. If you aren’t familiar with Hilary’s Eat Well, I reviewed them a month ago and I loved them. They’re really awesome burgers made of real foods, like beans, grains and veggies! You have a choice between the Spicy Green Chili Adzuki Bean Burger and The World’s Best Veggie Burger. Since I reviewed them, I’ve really warmed up to the Adzuki Bean Burger. It’s actually my go-to burger right now. 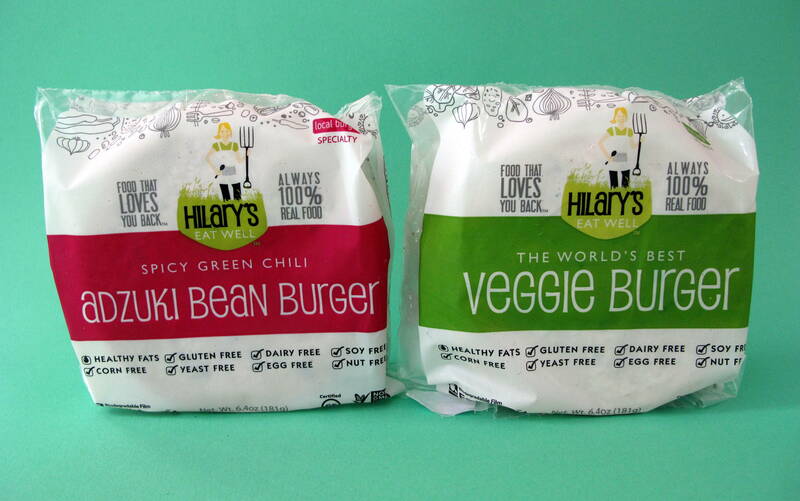 The best part is that you should be able to find Hilary’s Eat Well Burgers at your local Whole Foods! To enter, leave a comment and tell us what your favorite burger fixins are. Make sure to leave a valid email address so we can contact you. Five random winners will be chosen. Coupons are valid in the US only. The giveaway ends tomorrow, Thursday 10/11, at 4 pm CST. Good luck! Avocado, avocado and more avocado. mayo and avocado are my burger go-tos. Lettuce, tomato, pickle, red onion, mayo! If I am lucky avocado! Traditional fixin’s… relish, ketchup, onions. Oh man, now I’m craving a burger. lettuce, sauteed onions, hot peppers and ketchup! I think I’ve had the adzuki burger at Local Burger in Lawrence, KS. Delicious! My faves toppings are pretty classic–onion slices, lettuce, tomato, LOADS of pickles, vegenaise, mustard. Lettuce, tomato, red onion, guacamole and a little vegan mayo! Veganaisse, tomato, lettuce, and avocado! roasted green chilies, heirloom tomatoes, and sauteed portobellos, & spicy mustard. I love this brand b/c they have GF options! My favorites are lettuce, tomato, pickle, ketchup, and mustard! Hope I win!! Avocado, tempeh bacon and onion rings…can you say Western Style??!! My fav fixins are portobello mushrooms, carmalized onions, tomatoes, and bibb lettuce. Definitely avocado – mmmmmm!!! Also, tomato, lettuce, pickles, and mustard. I love Hilary’s! My favorite toppings are a nice piece of crisp lettuce, a thin slice of bubbies pickles and a layer of ketchup and mustard. Caramelised onions are a must but why haven’t I tried avocado?! I thought I would have put that with everything by now! My favorite burger fixin’ is Roasted Jalapeno Crema! I can’t eat enough of it! (roast, peel, seed and chop a jalapeno, mix it in some veganaise along with some hot sauce and maybe some garlic depending on your mood) Combine that with roasted tomatoes and I am a happy girl. Avocado and sauteed mushrooms and onions. Has anyone thought about topping their burger with avocado? 😉 So.. THAT, plus chipotle ketchup. Or tomato, red onion and arugula! avocado, tomatoes, spinach, hummus, onions! or i make it “southwest” with avocado and salsa! Lettuce, tomato, onion, and dijon–I’m a simple girl. Maybe some Daiya pepperjack if I’m feeling fancy. I like the classics-mustard, ketchup and pickles. Grilled onions and mushrooms are nice if I have the time. Love the Hilary’s! Roasted Red Pepper Hummus, and a slice of melted vegan cheese, yum! I’m not very creative with mine–I usually just go with mustard, onion, tomatoes, lettuce… and sometimes ketchup or pickles. I need to branch out a bit! I like avocado, basil, cilantro, & nayonnaise. Nummy num!! i love veggie burgers! My favorite toppins are: sauteed crimini mushrooms in all their glory! or avocado and salsa, yum! Onion, tomato, and dill pickles–yumm! Purple onion, heirloom tomato, arugula. Any vegan cheese + mushrooms. Red onion, lots of lettuce, pickles and bbq sauce! Veganaise, Sunflower sprouts, agave mustard, and tomatoes are all I ever need on my burger. switchtheswitchOh, this is a great idea (as healthysnacker sstuegged, not skullsnaps). I have been pretty obsessed with hemp seeds (every since you introduced them to me, healthysnacker) but this combo would not have occurred to me. Thanks! I LOVE a burger with grilled mushrooms and onions on it. And mustard and pickles! Hummus, avocado, onion, and tomato! Lately I’ve been going for thin slices of apple and red onion, shredded carrot and a schmear of tahini. Weird, but good. My favorite fixings are onion rings and ranch. YUMMO. Lots of tomatoes, hot sauce, and mushrooms make my day. Pickles are a must. Lettuce, tomato are standard. If I’m feeling fancy, some caramelized onion. Thanks for the giveaway! I have a stocked freezer with these burgers…yum! We love avocado, horseradish vegenaise, pickles, greens, and mustard. Lettuce, onions, ketchup, mushrooms and vegenaise. Oh man. I really liked these burgers when I bought them when they were on sale. I can’t justify the price when they’re not on sale, so this giveaway is fantastic. My favorite burger fixings are lettuce, avocado, cucumber, and hummus (It’s good, I swear!). avocado, sprouts, lettuce and tomato. oh and TONS of mustard. now I’m hungry. I like my burgers piled high with sauteed onions, avocados, romaine lettuce, chipotle vegenaise, and extra crispy fries or onion rings. Spicy mustard, a little ketchup, and sweet pickles….on a toasted whole grain bun 🙂 OR BBQ sauce….depends on the burger! I can barely fit my veggie burger in my mouth! Fixings always include: avocado slices, bread & butter pickles, spicy mustard , lettuce, sliced tomatoes. Hungry now! Mushrooms, especially the grilled marinated kind, along with any kind of greens and tomatoes. ketchup, mustard, garlic aioli….whatever…but MUST have avocado!!! I am quite partial to barbeque sauce, avocado, and Veganaise. I tried these at PDX VegFest a few weeks ago and they were awesome. Avocado is my number one burger topping, followed by Veganaise, chipotle anything, kimchee, and tempeh bacon. And I should mention that more often than any of those, but sadly under-appreciated, is spinach. avocado, jalapenos, and alfalfa sprouts! Tomatoes, caramelized onions, fresh basil, and a dollop of Vegenaise! BBQ sauce, sauteed mushrooms, and guacamole make a wicked burger. Carmrlized onions, arugula, and cashew cream. Nothing beats a big ol’ mess of green peppers & onions, sauteed in a little olive oil. Avocado (spread out), sauteed mushrooms, sauteed and fresh onions, sauteed and fresh sweet peppers, a dash of hot pepper paste mixed with ketchup and mustard, lettuce, a tomato, on whole wheat bread. Messy as all hell but it’s so delicious. And filling. If I don’t have avocado or the condiments (ketchup, mustard, paste) I use hummus, which isn’t as spicy, but is just as satisfying. grrrr… what’s the point of giving your email if it doesn’t post it?! Tomato, avocado, lettuce and pickles. Can’t go wrong! I love caramelized onions and sauteed mushrooms on my veggie burgers. Yum! Mmmm, standard toppings for me: lettuce, tomato, onion, pickle, avocado and lots of vegenaise!! Carmelized onions, sweet/hot pickled jalepenos, bbq sauce. Yum. My favorite burger fixings are coconut bacon and sauerkraut. Thanks for the giveaway! I tried Hillary’s at Natural Products Expo West this year and they were delicious! My favorite topping is vegan cole slaw. Vegenaise, daiya cheddar, avocado, tomato, lettuce and pickles! Maybe a little ketchup too. Yum yum. Mmm, ketchup, mustard and onions! OR spinach, vegan thousand island and onions… the possiblities! Hummus, avocado, and sprouts are wonderful toppings. Ketchup and mustard are fabulous too depending on what kind of burger I’m making. I love the green chiles! Yummy! Def caramelized onions, or pickles and mayo! lettuce, cucumber, tomatoes, red onions, pickles and mustard. Lettuce, tomato, pickles, and some roasted garlic Vegenaise. My favorite fixin’s for a burger would be a nice watery leaf of romaine lettuce, slices of tomato, alfalfa sprouts, pickles, and vegenaise. Yum! Romaine, avocado is a must mixed with pesto! I always put avocado, tomato, veganaise, and spinach on my veggie burgers! This is going to sound weird, but: steamed kale and sauerkraut w/ veggie burgers. Maybe some green goddess dressing too. 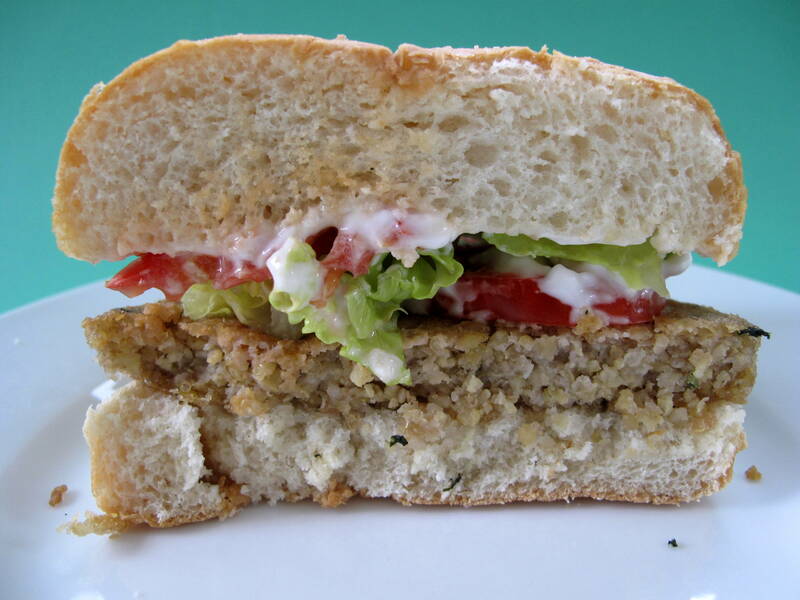 I love using avocado, sprouts, tomato, and whole grain mustard on my veggie burgers. lettuce, tomato, avocado, and/or garlic aioli! Onions, sriacha sauce, mushrooms and tomatos!! When I’m feeling kinda basic, I like the old classic set-up: juicy tomato, crisp onion, fresh spinach, a hearty mustard, and if the pantry gods are smiling, maybe a few slices of avocado. Sometimes I get crazy and dress ’em with sauerkraut or homemade miso mustard. If your patty platform is solid, the possibilities are endless! tomato, lettuce, onion, roasted red peppers and a tapenade spread! Avocado, tomato, spinach, & grilled onion & mushroom! Always avocado, jersey tomatoes when in season, and then whatever says hey you at the moment. I love avocado, BBQ, lettuce, and onion on burgers! Or if I’m in the mood for more typical, then veganaise, ketchup, and lettuce (and maybe pickles)! My favorite local burger joint serves a delectable black bean burger with fried onions, seitan bacon, grilled portabellos, and a chili-espresso rub. It is my weakness. I just saw these at the store the other day, I’d love to try them! No burger is complete without a little mayo and avocado. Love avocado, red onions, baby spinach and ripe tomatoes, so good! I like lettuce, tomato, onion, pickles & spicy mustard! gotta go with avocado and veganaise, and sprouts don’t hurt either! Mayo for SURE. Also some mustard. Pickles. YUM! My favorite burger is the Spicy Green Chili Adzuki Bean Burger with guacamole on a toasted Udi’s bun. If those choices aren’t available, then ketchup, a slice of cheese, a slice of onion & dill pickle will tide me over. Charbroiled butternut squash rings & lots of MUSHROOMS! Then drown it in ketchup. I love avocado on veggie burgers! bubbies sauerkraut! It goes on everything. I love to heat it and serve over sauteed kale and garlic! I just mash it up in the mix. Soooooo delish! Maybe add a little avocado or hummus (depending on my mood). And sprinkle with hemp seeds. MMMMM! avocado. red onion. mustard. hummus. raw kale. red cabbage. sliced radish. I saw these burgers the other day at a store. I thought I remembered hearing that they were supposed to be good. I should have gotten some! Next time! Oh, there are so many… Guess my faves would have to be caramelized onions & sauted mushrooms or maybe avocado, or even just the plain pickle and mustard. OH, and can’t forget my favorite purple Cherokee tomatoes. I’m craving a burger with caramelizzed onions, sauteed mushrooms, wilted spinach and chipotle-mayo on a potato bun brushed with oliive oil on the cut side right before toasting. Avocado would be nice on there too. My favorite burger fixings are Follow Your Heart vegan ranch, red onion, avocado, romaine, and tomatoes! Oh man, now I’m hungry. I like a veggie burger with avocado, onion, Vegenaise, and spicy mustard! Thanks everyone! Time to pick 5 winners!